The above was a message from my reader, Genie. Her request of having a post on the staple food in my kitchen struck my mind. It’s time to stock-check my fridge and food storage cabinet! Yes, I do have many things/ ingredients which have become my staple. As a seasoned cook at home, I just can’t “make food” without them (chuckling). I’ll change the types of pasta, from time to time, but surely store at least 2 different types at one time. Spaghetti (solid, thin cylinders), maccheroni (tubes or hollow cylinders), fusilli (three-edged spiral), Conchiglie (seashell shaped), and angel hair (very fine spaghetti) are my all-time-favourite. Corn starch, plain flour, cake flour, self raising flour and even cake premix. For cooking, frying (to make batter), and baking. Beside vegetable cooking oil, I have to keep a bottle of olive oil. For pasta meal, cake and cookies baking, and salads, sometimes. It’s a must for Chinese cooking, right? Not only light soy sauce, I store also the dark soy sauce. For fried noodles, bak-kut-teh soup and some chicken dishes. White pepper vs black pepper. Ground pepper, and pepper corns. These are the condiments I have to have them, for soup, fish and meat cooking. The normal oyster sauce mainly for seasoning purposes. 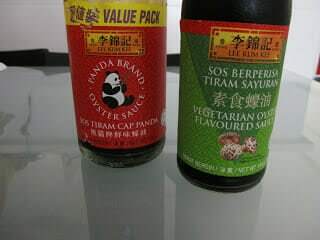 I have another bottle of vegetarian oyster flavoured sauce for my vegetarian meals. Shao Hsing Hua Diao Rice Wine, and white rice wine. Besides Chili sauce for dipping, I store Belacan chili paste, Sambal Chili paste, Chili paste with lime, too. It’s best to use for cooking prawns (Sambal Prawns). Yes, for many chili dishes. Even fried Keow Teow(flat rice noodles), I add a little of it, just to enliven the taste to its fullest. These are to be used for ‘instant’ cooking, when I have no idea on what to cook for the day. See, it helps to create sumptuous meal with these ready packed ingredients. For clear soup, sometimes. I bought the NO MSG type, most of the time. These are what I store in my fridge. Butter, as bread spread. More importantly, for my baking. Smile. Shredded cheese is to be used for pasta meal, omelette, and pizza baking. 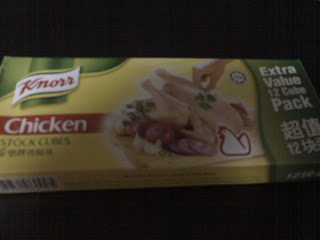 For cooking, and as part of my diet. 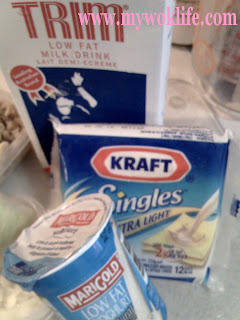 I loved low-fat dairy products. It’s fine even for a child aged from 7, to take low-fat food. In fact, it helps in lowering risk of cholesterol and obesity. A box of “bottles” for baking use. Different types of flavouring, such as, vanilla essence, mango flavour, strawberry emulco, chocolate emulco, pandan taste concentration, red ruby colouring, and some powder, e.g. cinnamon powder, and ginger powder. Oh yes, not to forget the compulsory stuff.. salt, sugar, garlic cloves and ginger in my kitchen. Smile. *Hope I am not too late for posting Genie’s request now.